Oh right, I understand. I suppose deep down inside, he really wanted a taste of army life instead of taking it up full-time. Or as its known in America, 'The Final Option' An SAS Captain is assigned to infiltrate an anti-nuclear weapons group that is being used as a front for terrorists planning a major operation. The story and script leave a bit to be desired at times and it wouldn't have hurt to make the film a bit shorter. It is still entertaining. On the plus side, Lewis Collins shows real movie star potential in the lead role of Captain Peter Skellen. It's a shame the film didn't lead to better things for him. There are a number of familiar faces amongst the cast including, Edward Woodward, Kenneth Griffith, Maurice Roeves and Ingrid Pitt. Patrick Allen makes a brief appearance. All of the stuff involving the SAS Anti-Terrorist team is good and well done. The hostage rescues at the end are well staged, exciting and realistic. 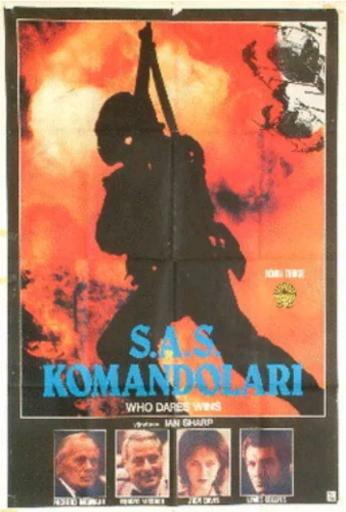 The film was inspired by an actual SAS raid on the Iranian Embassy in London. Who hasnt't watched the final assault sequence by the SAS multiple times? Superb film. I thought we had discussed this somewhere else but I feel this needs its own thread. LC's finest hour. Yes, I am sure I mentioned that Richard Widmark was a last minute replacement for the recently deceased William Holden. The film was shot between 11th January and 9th April 1982. It was due to commence filming in October 1981 but Judy Davis had work permit issues and guest star William Holden died in November. Holden's role was taken by Richard Widmark. I like William Holden as an actor and it's too bad he wasnt't in the film. One of my problems with the film is how the hostages and terrorists interact. I don't like the way Widmark and the others openly mock the machine gun toting terrorists. That always seemed stupid and unrealistic. Fortunetly it doesn't ruin the film for me. Yes, the film has a few faults but I still rate it as a great action movie and, to this day, I can't figure out why Lewis didn't go onto to have a great career in movies. How well did the movie do in the UK? I can only say that I saw it twice on its release in September 82 and both cinemas were packed. IIt's theatrical release in the US appears to have been limited and the film was not well reviewed. If it had played in my area I definetly would have gome to see it. I finally saw it when it was on the cable movie channel HBO and I remember watching it several times. It was released on VHS and I rented it a few times before I learned how to make a copy of it. It finally got a DVD release here in 2014 as part of a four movie set. I think there was also a Blu-Ray but it was paired with another film. I think it was director Ian Sharp, that when Lewis Collins passed away, described him as "Daniel Craig with Roger Moore's smoothness". I think that's an accurate description. I don't remember where I read that but I believe Sharp may have been commenting on Lew's potential as James Bond. 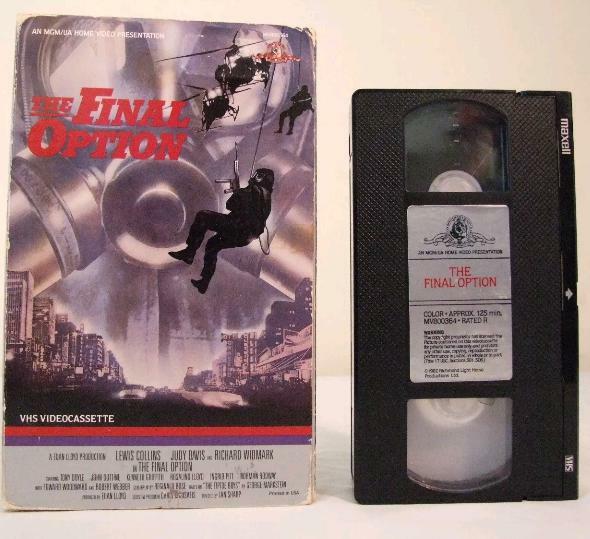 That VHS of The Final Option is what I rented a number of times from a local store. At some point I was able to copy it . However in this case(!) 'The Final Option' as with many others I saw back in the day were really able to grab your attention enough to pick it up and hand over your hard earned. With VHS I really used to judge something by its cover. Think the film could and should have been better produced. It's now very dated with all the anti-US airforce demos. Just wish Lewis had better lines to demonstrate his talent. It's watchable, although I fast forward the 'Dove of Peace' and the ruck in the church scenes. Too hammy for my liking. I think the only thing that really dates it is that dreadful play in the middle. I thought that was awful 34 years ago. I rate the movie 8/10. The play/performance art scene was painful to watch even back in the '80s. I do like the way Lewis Collins says "I thought it was a load of anti-American cr*p!". Yes, I thought it just cr*p! Lew knew what he was talking about! This was one of the first DVDs I bought when I first got a player. They again it was one of the VHS tapes I bought when I first got a video recorder too! I'll have to get the blu-ray soon! As for the film itself it certainly does drag in bits and is very dated in others but nonetheless the action scenes are as good as any in any film thirty odd years later. the action scenes are as good as any in any film thirty odd years later. It was the first film i watched in which the gun battle scenes looked like they'd been researched and were fairly realistic. IIRC i watched Who Dares Wins and First Blood within a few weeks of each other and the diferrence between the two was easy to see. Rambo let loose with his machine gun and blasted everything in sight with seemingly everlasting ammunition whilst it was good to see the SAS methodically and professionally fighting their way through the terrorists. One of the strengths of the film is that the SAS members act like soldiers rather than typical heroes in an action film. This is clear during the final raid. They have a job to do, they do the job and it's based on training an a method to achieve their goal. I think the appeal of the film is watching and learning about the professionalism of the SAS regiment as a whole rather than, as you say, cheering on a couple of heroes. However, Rambo was mentally unstable and Stallone himself wanted him not to kill anyone in cold blood, even though he wounds 2 men in the film. The SAS were shown in the movie to be an intelligent, tactful armed response force that acted quickly and accurately. You should check out the Saracen pilot episode The Zero Option (an extra feature in the Saracen DVD set) which features a similar raid carried out by the SAS. Having been a massive Professionals fan this is one of my all time fave films. I waited until it was broadcast on tv to see it (can't locate that archive resource now?) and thought it was great. I remember seeing the libyan embassy raid on the news when it happened and thought this obviously took a lot of cues from that. An easy target for critics, I still enjoy it and wouldn't be too unhappy at being held hostage by the ever lovely Ingrid Pitt, sadly also long gone. Much has been said of the 'play' in the middle but I remember a 'big' school assembly around '82 where a group of girls put on a skit about nuclear war etc (CND was big at the time) whereby they pranced around singing lennon's 'give peace a chance' dressed up like missiles! Well, I say missiles, running around in black bin bags with a pointy hat on. Sound familiar? Dunno whose idea that was. Thanks. Thinking about it, at the time we had a drama teacher and an RE/drama teacher who were both a bit 'right on' so I'm thinking they probably went to see the film at the flicks; for the political stance of course, not Lewis' rippling muscles! The girls were older than us too, and one of the more vociferous ones went on to be head girl I think. All very 'grange hill' and S.A.G. ! Haha ! Did we go to the same school ?!? Funnily enough I remember a very similar event during an assembly one day with the kids involved being egged on by some teachers with very overt political sympathies - it went down like a cup of cold sick, particularly with those of us whose fathers/brothers were serving in the South Atlantic at the time. Anyone know what happened with the film on the Iranian Embassy siege in 1980 called "6 Days" ? It had a good cast - Martin Shaw , Mark Strong, Jamie Bell - seems to have sunk without trace ?!? No I don't think so, different locations, but it's interesting to find common themes/coincidences like that. I guess it was in the air around that time - the nuclear clock set to 23:58, the Threads docudrama etc. I wish I could remember exactly when it was, but we were lower school at the time meaning 1st or 2nd year (and I'm talking proper years here not this year 9 bullsht) and I started big school in sept '81 so it must've been sometime before sept '83 when I moved to upper school for 3rd year. I used to hate those big assemblies when there would be some sort of 'show' put on by pupils 'cos they were universally embarrassing crepe. Yes I did once get roped into one. However on this occasion some of them older lasses were a bit fearsome so we kept our critiques to ourselves!